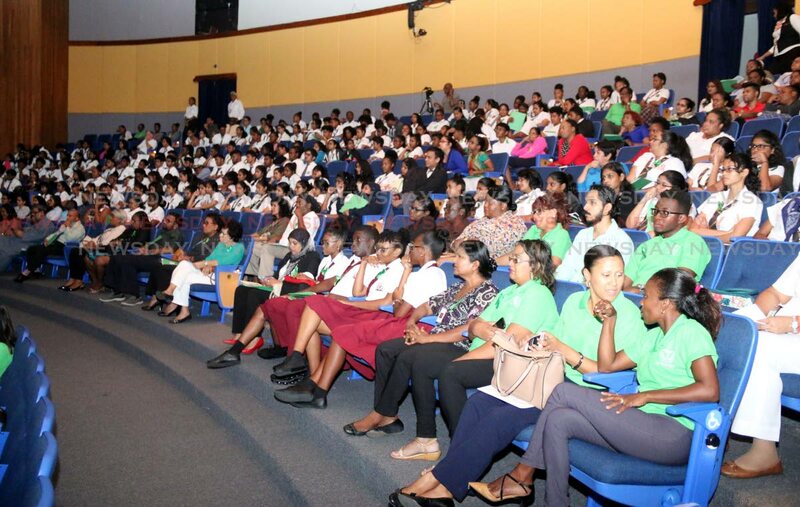 Students of various schools in south Trinidad at menal health discussion held at Naparima Bowl. IN KEEPING with World Mental Health Day Wednesday, the South-West Regional Health Authority (SWRHA) held a symposium at Naparima Bowl in San Fernando. The SWRHA focused on youths under the theme Young People and Mental Health in a Changing World. Prolonged and excessive use, she said, presents dangers that have become more evident in adults as well. Dumas said while social media had given rise to elaborate virtual communities, they had served as a platform for less beneficial and troubling occurrences at both individual and societal levels. The auditorium was filled with form five students from Naparima Boys’ and Naps Girls’ and ASJA Boys and Girls’ College, as well as Presentation College and Pleasantville Secondary School. Mental health officer Merene Singh dealt with the topics of bullying and peer pressure. Singh explained that bullying is a form of aggression in which someone intentionally and repeatedly causes another person injury or discomfort. “Bullying can take the form of physical contacts, words or subtle actions,” Singh said, adding that most times bullies are themselves bullied at home and look for balance to life by bullying others. She spoke about social bullying, in which a group of student can exclude a single student from activities causing hurt to that person. “Lying and speaking ill of fellow students is also social bullying, and this can lead to depression and mental illness among students who are victims of social bullying. “Bullying is predatory and antagonistic behaviour that contributes to the silent misery of millions of students and puts some at increased risk for suicidal thoughts and behaviour,” Singh said. Students also saw slides on drug abuse showing the effects of cocaine and marijuana on the body. They also viewed documentaries on the ways drugs can affect the brain, causing mental problems. Former chemistry teacher Caron Asgarali addressed them on post-traumatic stress disorder. In 2013 Asgarali was was shot in the face during an attempted carjacking by attackers who were never caught. In June this year, she was nominated for her work in victim support system and her involvement in social work. “I was left with a gaping hole in my face, unable to speak for over three weeks, as my tongue was almost severed,” she said. She spoke about the extent of her injuries and pain, saying her brain had to overcome the notion of pain in order for her to survive. Students listened attentively when Asgarali relived her life-and-death experience and said she chose to survive despite the mental and physical pain, the challenges she faced in picking up the pieces and returning to life in TT. Reply to "Social media can lead to mental health problems"